But I don’t like them, and I never use them. Why? Because the risks of using them, as well as the preconditions for using them, outweigh the benefits. Although you have seen snowchains on almost EVERY vehicle group in winter tours in continental Europe, you’ve NEVER seen them used on vehicles custom built for usage in polar expeditions. And you probably wonder why? However much snowchains do improve hard snow traction, they’re just a lousy supplement for something that you can’t fit on a factory (or near factory) outfitted offroad vehicle – the huge, heavily underpressurized tyres which increase the footprint of polar vehicles (as well as their ground clearance) to the level that would never be possible on a stock vehicle. And that is exactly what helps traction most on a 4×4 vehicle and brings it a step closer to vehicles with tracks. Besides, when you don’t have solid ground anywhere near underneath (as is the case in polar areas), the digging of the chains is counterproductive. In “normal” winter conditions, snowchains ensure your forwarding momentum when you’re on the move, and can also help you start – if you know how to do it properly. But can also “help” dig you in hopelessly much, much faster in soft and wet snow. In fact, they give you only a slight edge in traction over good qulity (extreme) MT tyres. You certainly will not want to use the tiny chains that are commonly seen on regular passenger vehicles (even if you manage to find them in the adequate size), because those will almost certainly break in the first half hour of heavy offroad (ab)use, possibly ripping other components as they hit around the tyre loose (like brake hoses and ABS wires, etc.). What you will be looking for are the heavy duty truck chains. And yes, they’ll be not only expensive, but, as their name says, HEAVY as hell! They’ll probably outweigh the entire wheel (rim + tyre), which means that they will present considerable weight that your axles and differentials will throw around with quite a bit of strain on them. Everyone who has done any winter offroading knows very well that driving in heavy snow conditions is the most extreme environment for the drivetrain, where you never just slightly “touch” the pedal. Most of the time it is a fierce fight, a “pedal to the metal” struggle with the elements. And in such conditions, how long do you think that other components of your vehicle will be able to endure the extra load of the chains before they break down? Almost anything! Your bearings are not constructed for such heavy load, your shock absorbers, bushings, springs, links, bars… And most of all, the axles and differentials are not built for it. If the traction force produced by the chains becomes too high at some point, your axles can crumble just as easily as when inappropriately using difflocks on dry surface. You will very quickly find out that “snowchain fun” is the most expensive sort of offroad fun that you can have – the price of which greatly outweighs the base price of the tour you’re taking part in. When considering the usage of snowchains do not forget that you also have to mount and dismount them – depending on the dynamics of the tour, maybe even quite often. And with the heavy duty truck chains that can be not only complicated, but in the winter conditions, in the midst of blizzards and cold below -20 C, often life threatening (another reason why polar expeditions are not considering snowchain usage). Are you sure you’re such a masochist? Also, chain mounting has other prerequisites that you have to think of. Before buying chains, ensure that your wheelbases are large enough to accept them on top of the tyres. Your lift may be large enough to take the tyres that you’re using without rubbing, but for chains you have to check if it’s large enough for at least two size bigger tyres. Because that is exactly how high and wide your tyres will be with the chains mounted on them! In many cases that will mean the necessity to either buy a size smaller tyres for usage with the chains, or install a more serious (and expensive) lift for your car. In rare cases, you can get away with only adding some wheel spacers (but these will also contribute to faster wear of your bearings). Whether or not you will actually be able to drive on the snow that you encounter does not depend on snowchains much. It’s mainly a question of snow depth, and hardness (consistency). If the snow is deeper than the base of your differentials, in most cases the trip is over for you, and chains won’t help you solve that at all. The only case when you will probably be able to drive in snow that is deeper than the clearance of your vehicle is if you’re driving in fluffy, powdery, “virgin” snow. Unfortunately, it can’t retain that quality for long after the snowfall. After a week or two all the powder will settle down and become hard packed, seemingly lower. But in that condition you have no chance to get through if it’s still higher than your diffs (even using snowchains). Your only chance to move across that kind of snow is by attempting to stay on top of it – either by drastically deflating the tyres to increase their footprint, or by mounting snowtracks instead of standard wheels. Chains not only do not help to move in such conditions, but are a death sentence for your efforts to do so. And they certainly can’t help with snowdrifts, which are formed by the wind in winter and are quite common on unmaintained roads – shovelling through is the only way to resolve a snowdrift (in case it isn’t too long, but unfortunately, they often are). 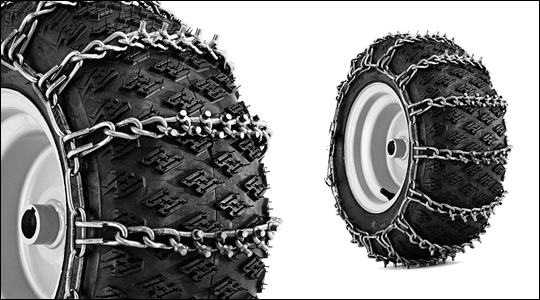 There are only two situations when chains are really helpful – in hard snow that is up to differential height (so that you have a realistic chance to cut through it with your wheels), and in extreme icy conditions, where any rubber will simply slide across the ice without control. To use snowchains or not? That is something that I let the participants of my tours decide for themselves, rather than imposing it as a prerequisite. Many of those who arrived with a set of 4 chains in the back of their car never mounted them, and were quite happy with the experience, even after driving through extreme winter conditions. Don’t ever forget that winter overlanding is the most expensive, and potentially the riskiest sort of 4×4 travel. Don’t let the fun turn into frustration!